Fund Raising and donations are crucial to the continuation of the provision of our service and we must raise our annual operating budget of approximately £50,000 from these sources and contributions from our riders. As well as the costs of keeping our horses (eg for feed, shoeing, veterinary care, physiotherapy, saddlery and rugs) we have many costs associated with the upkeep of our sizeable site and insurance costs to cover volunteers, staff and our facilities. We rely heavily on volunteers to provide our service so that staff costs are kept to a minimum. We do have a paid Stable Manager and a relief who are key to the smooth running of our operation and to the quality care of our ponies. Our major annual fund raising event is the Sponsored Ride, which is generally on Good Friday. We raised over £11,000 in 2016. The ride takes place over an 11 mile marked route through Surrey woodland, heath and hills. There is also a 3-mile route for led or accompanied–on-foot riders. 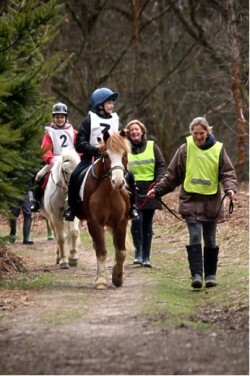 Riders from all over the south east of England take part to raise money for our Group. It is a wonderful example of the able-bodied riding community facilitating riding for their disabled counterparts, all sharing a love of horses. Our volunteers all work hard to make the day possible – we couldn’t do it without them. Funds raised from the event are crucial to the Group’s finances and all donations and forms of sponsorship are welcome. We are always grateful when local companies support our work. In the past some have donated time or particular items of equipment and others have made donations to our funds. These are always tremendously welcome and can enable us to buy things that would otherwise be difficult for us to fund. For example The Community Foundation for Surrey have supported our group on several occasions over the past few years and most recently enabled us to purchase new hats for our riders and some PR material. The M&G Investments Staff Charity Fund covered the cost of a new hoist for our indoor school. Often though we just need help meeting the relentless bills associated with keeping the horses. For example Sanofi generously raised over £650 towards our running costs. As well as individual donations we always welcome opportunities to build partnerships with businesses and other organisations in the local community. These community partnerships are vital to enable us to continue to give our riders the opportunity to ride to benefit their health, have fun and achieve their ambitions. As a local charity, the support of our local community is greatly valued by our riders, their families and our volunteers. For example, Cranleigh Lions have raised over £2,000 for the Group. Other community help has included spring cleaning the stables by Community Pay Back Teams, and volunteers from Royal and Sun Alliance Insurance Group. The ‘100 Club’ provides a steady and reliable form of financing throughout the year. Last year we raised £950. For only £1 per month (payable annually) you can have the chance of winning £50 each month! Just complete the application form and send the standing order form to your bank. (You can pay by cheque if you prefer but it does increase our admin costs). Our Adopt a Pony scheme gives you the opportunity to adopt one or more of our ponies for a year. You will receive an adoption package to include a photograph, a badge, an Adoption Certificate, a newsletter and a Christmas card from your pony. 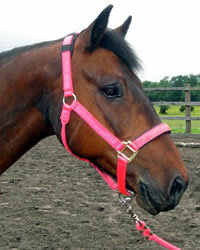 You will be able to meet your pony by prior arrangement with our stable manager. More information is available on our Adopt a Pony page.